The censer is of globular form below a pinched neck rising to a gently flared mouthrim and is supported on three round tapered feet. 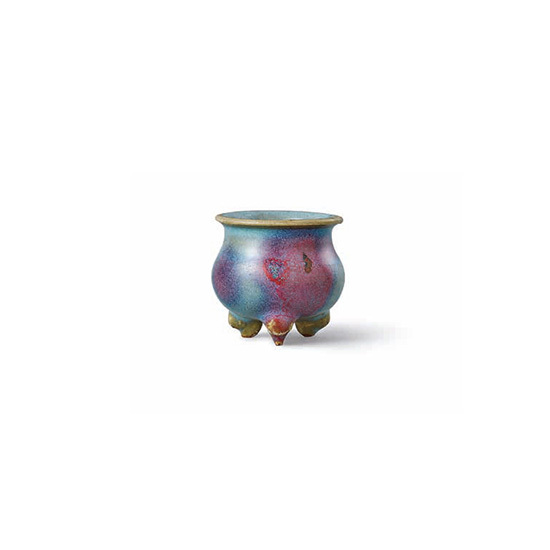 The censer is covered on the interior and exterior with a slightly translucent lavender blue glaze of even tone with copper splashes along the body of the vessel. An example of a small Junyao tripod censer with copper splashing is illustrated in Chinese Ceramics, Bronzes and Jades in the Collection of Sir Alan and Lady Barlow, London, 1963, Catalogue No. 37b.